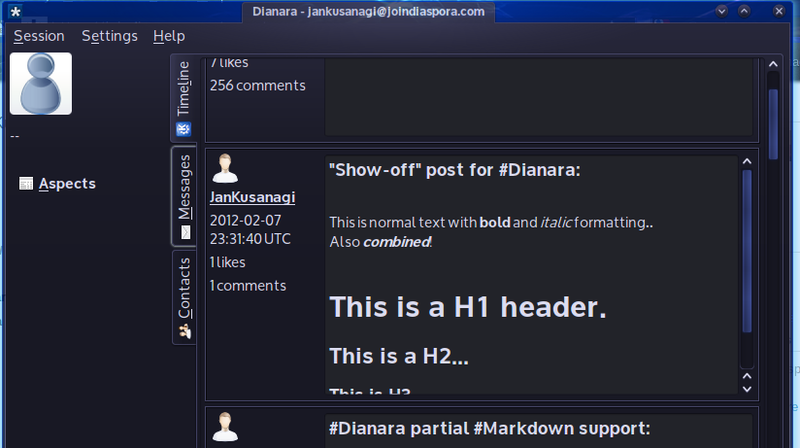 I’ll be releasing Dianara 1.4.0 Soon™, so if you use it, it’s a good time to put the development version to the test. If Dianara is not translated to your language and you’d like to have it, contributing a translation is quite easy! But there’s a catch: the contact list data works using Pistos’ Fake API, something temporary he added to his Diaspora fork, for developers to play with. This means you’ll only be able to see your contacts if you have an account on one of the pods using Pistos code. But then you won’t have the timeline posts. I have a 0.1 “demo” version in Qt-apps.org, but there are many changes in the git/development version, including all the above. Simple and ugly right now, but hopefully, it will be nicer in the future! 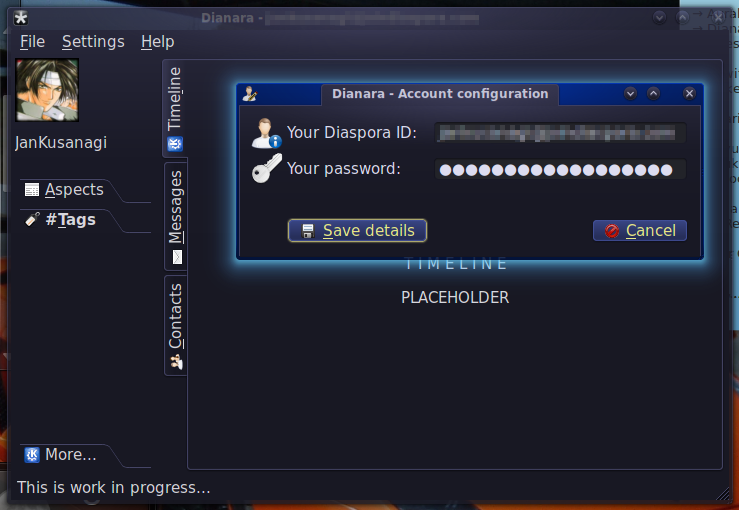 With Auralquiz 0.8 out the door, I’ve now turned my attention back to Dianara, my Diaspora app, for a while. 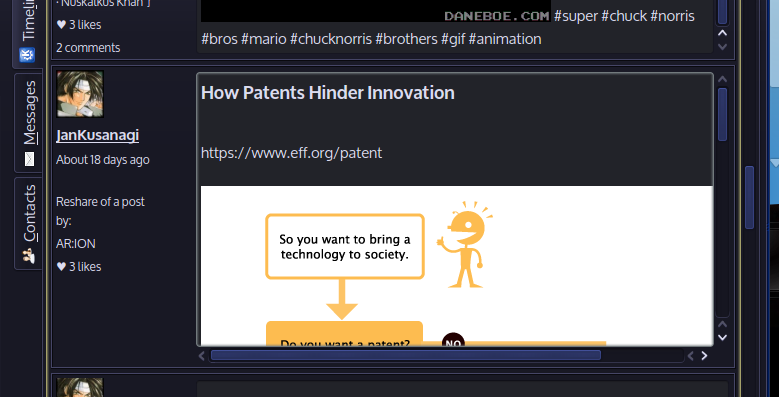 There’s a lot more API available now, so Dianara can fetch the first page (15 posts) of your public timeline, and display it. There is some basic Markdown rendering (bold, italic, and headers), and basic information about the post: Author, creation time, number of likes, number of comments, and, if it’s a reshare, the name of the original post’s author. There is no OAuth authentication yet, so it is not possible to see your stream, aspects, contacts… well, anything not public. In the Account dialog, the “access token” field can be filled with anything, it’s not used at this time. But hopefully soon! I’ve started developing a new program. This time it’s a Diaspora client, an application for GNU/linux that will allow users to manage their Diaspora accounts without the need to use a web browser. At the moment, it’s basically an empty shell. 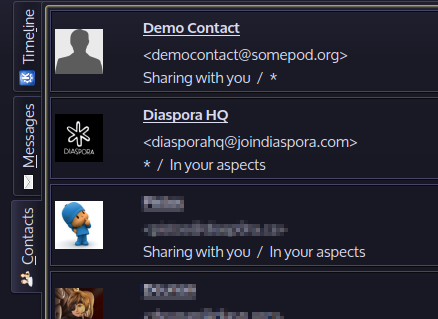 The only thing you can do, is enter your Diaspora ID (username@podname) and password, and see how your avatar and full name are fetched from your account information. Diaspora‘s API is not ready to use yet, so there’s not much that can be done at the moment. Meanwhile, I’ll keep improving the interface, and the little network control there is now. It is, like my other projects, based on Qt, and as an aditional dependency, QJSON. 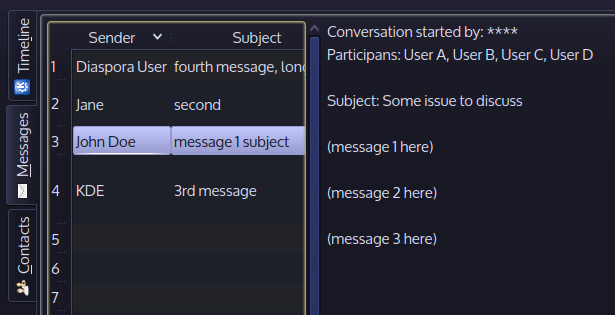 It also supports FreeDesktop.org notifications, so you get nice notifications in KDE Plasma Desktop, Gnome, XFCE and other environments which support that specification.